NBC’s Matt Lauer has landed George W. Bush’s first one-on-one TV interview since Bush left the Oval Office in 2009. The interview, timed around the publication of Bush’s memoir, will air in primetime as a “Matt Lauer Reports” special on Monday, November 8. Bush’s book, Decision Points, will be released the next day, Tuesday November 9. 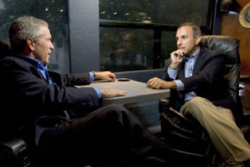 On Wednesday, November 10, Bush will join Lauer live on the “Today” show. “President Bush will talk to Lauer about the details of his upcoming book…and he will discuss the defining decisions he has made in his personal and political life,” NBC News said in an announcement. The interview will air the week after the midterm elections.